We show that an information nudge increased the rate of American citizenship applications among low-income immigrants eligible for a federal fee waiver. 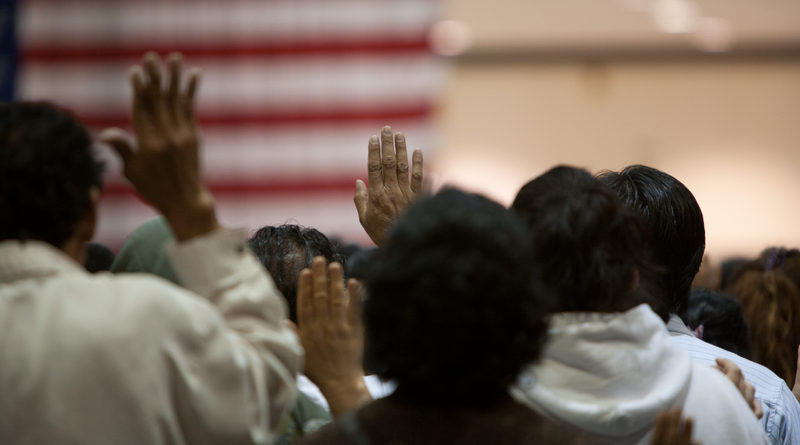 Approximately half of the 9 million naturalization-eligible immigrants qualify for a federal programme that waives the cost of the citizenship application for low-income individuals. However, take-up of this fee waiver programme remains low1,2,3. Here we use a randomized field experiment to test the effectiveness of a low-cost intervention (a ‘nudge’) that informed low-income immigrants about their eligibility for the fee waiver. We find that the information nudge increased the rate of citizenship applications by about 8.6 percentage points from 24.5% in the control group to 33.1% in the treatment group (ordinary least squares regression with robust standard errors (d.f. = 933); P = 0.015; 95% confidence interval ranged from 1.7 to 15.4 percentage points). We found no evidence that the nudge was less effective for poorer or less educated immigrants. These findings contribute to the literature that addresses the incomplete take-up of public benefits by low-income populations4,5,6,7,8,9,10 and suggest that lack of information is an important obstacle to citizenship among low-income immigrants who demonstrate an interest in naturalization.